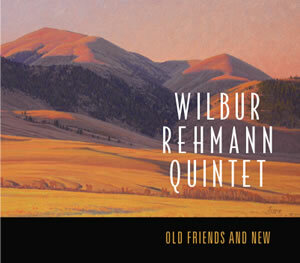 Wilbur Rehmann and his Quartet have brought to us a sense of joy, wonder and solitude with their original jazz interpretations, which explore the interior landscapes of the American West and the meaning of wilderness. 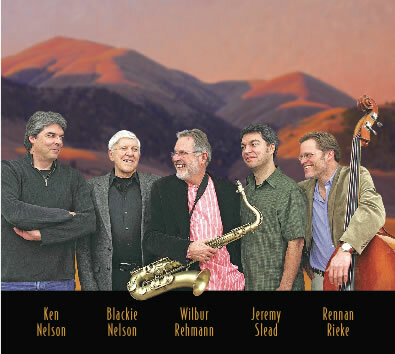 Wilbur Rehmann is leader of the quartet/quintet and he plays alto, tenor, soprano and baritone saxophones. His clean sound on alto is reminiscent of Paul Desmond but his big, full sound on tenor is as gutsy as Ben Webster or Coleman Hawkins. He is an original and creates music influenced by the high mountains and open plains of Montana. He has performed with Dizzy Gillespie, Clarence “Gatemouth” Brown, Arnett Cobb, the Big Sky Mudflaps and M.J. Williams. Besides performing, Wilbur is a lecturer in the Montana Humanities Speakers Bureau on jazz history and styles workshop. Blackie Nelson is one of the finest guitarist anywhere. He began playing guitar in the Forties and has a unique sound reminiscent of Tal Farlow. Blackie has played all over the Northwest and has nurtured many young musicians and vocalists. He is the supreme guitar player and consummate musician. He also is an excellent pianist and acoustic bassist. He knows more songs that anyone should and he plays that all quite well. Ken Nelson is a great pianist and keyboard player. His piano solos are both beautiful, full of soul and hard driving. Ken also doubles on guitar and bass when called on. His knowledge of the jazz tradition is as vast as his creative ability, and he plays everything expertly and uniquely. Listen to the piano on the Old Friends and New cd, you’’ll know in an instant that Ken is a “jazz player”. He is also a professional sound engineer who has recorded numerous musicians in all styles. Rennan Rieke plays wonderful acoustic bass and gets a wonderful full sound from the instrument. He keeps a steady walking rhythm going and often becomes a “wild man” when he solos. He has been playing bass quite some time even though, in his youth, he put his time in playing rock and roll guitar. He finds that the acoustic bass suits him better and he hasn’t looked back. Jeremy Slead is one of the best drummers around. Jeremy plays straight ahead rhythms to provide a steady and complex beat for the group. He excels on his solos in which he plays the song, not just random rhythms. He is always capable of dynamic solos even when he’s just “trading fours” with the rest of the group. Jeremy grew up in Helena, Montana and has played in everything from polka bands and classic rock power trios to swing orchestras. Jeremy is a full-time schoolteacher in a gifted and talented program.